The automobile dealers industry faces some unique challenges. The gears of daily operations must work within the machinery of internal controls to drive your business performance forward! Auto dealers also have to deal with complex financial statements and specialized accounting and tax methods. Through years of experience, Trout, Ebersole & Groff, LLP has developed an expertise in servicing clients in the auto dealership industry. 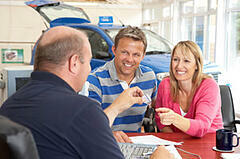 We can provide sound advice on dealership finance, accounting, management, and taxation.